French: Indicateur écaillé; German: Strichelstirn-Honiganzeiger; Spanish: Indicador de Garganta Escamosa. Source of common name "scaly-throated" is network of small, alternating light and dark spots (not of scales, but feathers) adorning the throat and extending down onto the breast like a long bib. 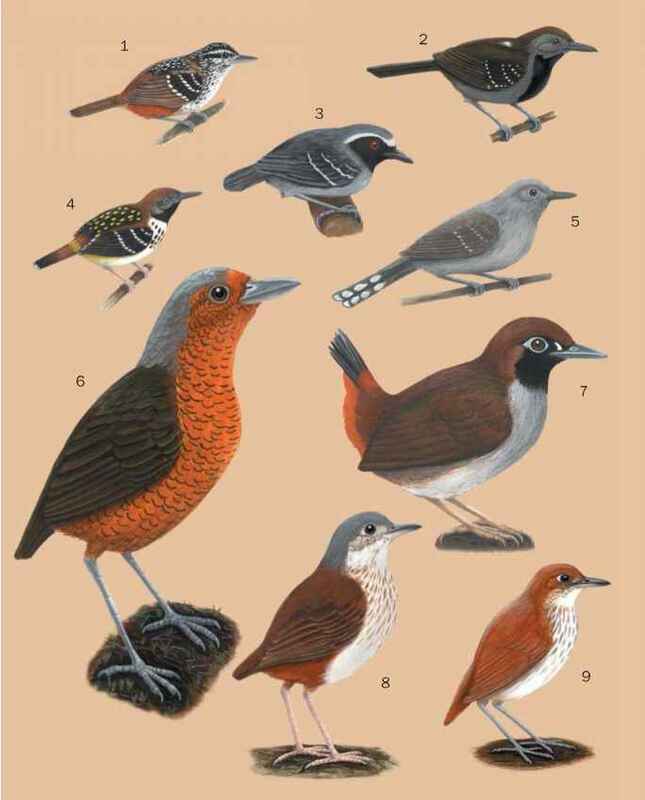 Otherwise, colored as most honeyguides, gray-olive on upperparts, off-white along breast and belly (except for spots). Eastern South Africa to southern Sudan, Ethiopia, and Somalia; also in west Africa from coastal Angola to Zambia. Forest patches and wooded and dense vegetation along rivers in dry areas. Show wide range of vocalizations fitted to situations. Males assert or threaten with a high-pitched whistling. Females in similar mode make loud chatterings. Both sexes accompany aggressive voice with rustling wing sounds. An aggressive species, individuals generally dominate a beeswax source as a feeding post, but will make off with small chunks of comb and eat them elsewhere. Also eats bee larvae and adults, waxmoth larvae, beetles, and other insects, including termites, on which they gorge on the wing when the insects emerge in hordes. Occasionally takes fruits and seeds. Small groups sometimes join mixed-species flocks of foraging birds. Male displays for female similarly to greater honeyguide.